Early 20th century concealability that still meets today's demands. It's hard to believe, but in a couple of years, the vaunted Walther PPK turns 90. Still, for an almost-nonagenarian, the little chap's looking pretty spry. Without question, this very pocketable double-action (DA) semiautomatic is one of the top three or four most recognizable and esteemed hideouts and has a respectable ranking in the pantheon of top self-loading handguns ever. The PPK is certainly one of the most storied and famous members of its clan, probably best known to the greater majority of people — even nongun types — as the trusty companion of author Ian Fleming's master-spy "James Bond". The pistol has also been, by choice or issue, the sidearm of countless military personnel, police and civilians. Most importantly, according to some accounts, it performed the world an inestimable service by being the instrument with which Nazi dictator Adolph Hitler sent himself into the underworld. Starting out strong, even with the appearance of more modern, powerful carry autos, this seemingly timeless standard still has a very devoted following. However, the PPK did not spring fully formed from the sky but rather evolved from a slightly earlier DA — the PP (Polizeipistole or "Police Pistol"). The PP was introduced by the esteemed German gunmaking firm Carl Walther Waffenfabrik in 1929. Pocket autos were nothing new when the PP/PPK line first appeared, the most notable being the 1900 FN designed by John Browning. From that point on, Browning had something of a lock on the genre, with such classics as the Colt 1903/08, FN "Baby Browning," and another all-time great, the FN 1910/22. That is not to say other makers didn't also leave their mark with scores of 6.35mm (.25 ACP), 7.65mm (.32 ACP) and 9mm Kurz (.380 ACP) autos appearing before, during and after World War I. With Walther's introduction of its first .25, the Model 1 in 1908, and a premier .32 in 1910, the line of Walther single-action (SA) autos would continue into the PP/PPK era. During this time, DA autos were being toyed around with, though like the Noble (1905), which was briefly evaluated by the U.S. military, and the Model 1894 Mannlicher "blow-forward" pistol, these guns were in larger service calibers and were generally unsuccessful, barely advancing beyond a prototype. This all changed in 1929 when Walther brought out the Model PP. Though a blowback like most of its predecessors and constructed of a slide that surrounded a fixed barrel in much the same manner as the earlier Model 8, it possessed a wonderful DA that allowed the pistol to be carried with the chamber loaded and the hammer all the way forward. 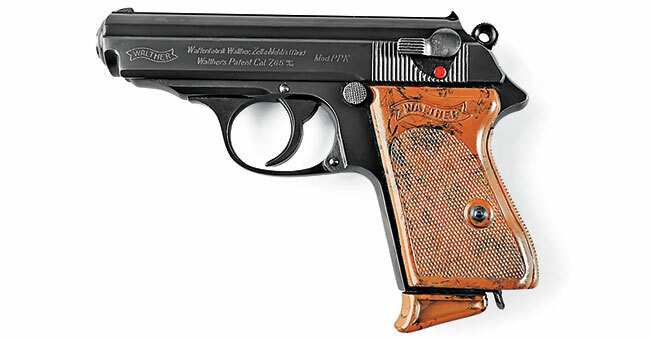 The Walther PPK was a handy double-action semiauto measuring just over six inches in length. Ultimately, this versatile pistol would be available in 7.65mm (.32 ACP), 9mm Kurz (.380 ACP), 6.35mm (.25 ACP) and 6mm (.22). To operate the piece, one inserts a loaded magazine in the well, then draws the slide rearward and chambers a round upon release. The pistol is now ready to fire in SA mode. However, if the bearer wants to tote it around safely and still have it ready to go, they just have to push down on the safety/decocker catch that's located on the left side of the pistol with their thumb. This drops the hammer and rotates a hammer block between the hammer and spring-loaded firing pin, positively separating the two. At this point, with the catch in the lowered position, the pistol is on "safe." Moving it upward, the DA system is activated and the pistol can then be fired simply by pulling the trigger. Subsequent shots will be in SA mode with the slide remaining open when all ammunition has been expended. An indicator pin protrudes from the rear of the slide showing the piece is charged. Some pistols without this feature were also made and could be had for a few pfennigs less. Interestingly, the designers thoughtfully gave the magazine a frame-mounted button release, unlike many other European semiautomatics at the time, which employed heel catches. Early PPKs came in a fancy cardboard box, which also included a spare magazine, dummy "exercise cartridges," a cleaning kit, a cleaning rod and a manual. In the early 1930s, this set sold for around $15.50. Takedown is also quite easy. Just remove the mag and make sure the gun is unloaded. Then the front of the triggerguard is pulled down and secured on the underside of the frame. Now, it is a matter of pulling the slide to the rear and up to disengage it from the frame and then remove it along with the single recoil spring forward off the barrel. From the outset, the PP was a sensation with police departments, the military and civilians. From a timing standpoint, the gun's introduction couldn't have been better with the rise of German nationalism in the 1930s and the beefing up of the military and police. By the time the Third Reich was firmly established, the organization of the German police forces had undergone a series of changes, and by the end of the 1930s, the police had achieved an interesting evolution. Pre-war and World War II-era PPKs were manufactured at the Walther Plant in Zella-Mehlis, Germany. These are typical early slide markings. The Ordnungspolizei (Order Police, abbreviated "ORPO") was basically comprised of uniformed police. The Kriminalpolizei (Criminal Police or "Kripo") was involved with criminal investigations. The Geheime Staatspolizei ("Secret State Police" or "Gestapo") formed by Hermann Göring in 1933 and taken over by the Schutzstaffel (SS) a year later, performed duties as its name implied. In 1936, all police forces were administered by the SS under Heinrich Himmler. For a short period (1936 to 1939), there was also the Sicherheitspolizei (Security Police) which was comprised of the Gestapo and Kripo under the watchful eye of Reinhard Heydrich, though this was later melded with the Reichssicherheitshauptamt (Reich Main Security Office or "RHSA"). Besides being quite interesting, I've included this précis about Third Reich law enforcement (such as it was) to give the reader an idea of the quantity of pistols that would be required to arm such a large and pervasive organization. Add to this the need for small handguns by various factions of the Nazi party, not to mention other agencies and the armed forces (the German Army alone purchased some 50,000 units), and you get an idea why the PP/PPK line became so well known and popular. We don't mean to infer they were the only pistols of their type to see service, far from it, but they were certainly favored. By the end of World War II, the Germans would also field two other excellent DA pocket pistols — the Mauser HSc and the Sauer 38H — along with a huge quantity of SAs both domestic and foreign ranging in caliber from 6.35mm to 9mm Kurz. Though certainly not large (6.7 inches long, 1.2 inches wide and 4.3 inches high, and weighing just 23½ ounces), the 7.65mm (.32 ACP) PP was still considered something of a waist-belt holster arm and police agencies petitioned Walther to make the gun even handier and more appropriate for concealed carry beneath a leather trench coat or tuxedo jacket. This the firm did in 1931. The PPK, though outwardly and inwardly built on the PP platform, was noticeably smaller, its overall length was trimmed by slightly over a half inch, the height by .4 inch and width by .2 inch. Weight was also reduced to 21 ounces. Initially offered in .32 ACP, the PPK would eventually be chambered in .22LR and .380 ACP. Optional 4mm subcaliber devices were also available for the PPK. They included a barrel insert, 4mm chambers, a cleaning rod and an ejector rod. The centerfire cartridges were low velocity and suitable for indoor practice. While it's obvious the PPK had considerable military and police application, it must be remembered that early on it was offered for sale to the general public. Standard finish was blue with marbleized bakelite grips. Commercial PPKs came new in wood-grain-printed cardboard boxes along with a spare magazine, an instruction manual, and a trio of dummy "exercise cartridges" to test the function of the pistol without having to fire it. Equally clever was the 4mm subcaliber kits that allowed indoor target practice. These diminutive practice rounds were inserted into special chambers, which are manually fed from a standard PPK magazine and then ejected by hand. The 4mm cartridges could be purchased in rolls containing 10 boxes of 100 rounds each. Because of their widespread use, many variations of the PPK are popular collectors' items. These include standard commercial versions, police, Nazi party and military variants. Some were highly engraved and decorated for gifts to highly-placed military and diplomatic officials. Military and police arms are particularly interesting in that besides the standard proofmarks such as the "Crown N" prior to 1939/40, the "Eagle N" was used after that date up to the end of the war. As the war progressed, finish and grip material deteriorated somewhat, though the overall quality of the guns never suffered. Prior to 1939/40, proofmarks consisted of a crowned "N". This was later changed to an "N" surmounted by an eagle. Unlike the superb Sauer 38H, which ceased production in 1945, the PP/PPK line continued to be manufactured. After the cessation of hostilities, Walther relocated from Soviet-controlled Zella-Mehlis to Ulm in West Germany. However, because the Allies did not allow arms to be made in Germany immediately following the war, PPs were produced by the French firm Manufacture de Machines de Haut-­Rhin, more commonly referred to as "Manurhin." They continued production until 1986. The PPK and PPK/S (a variant of the PPK featuring a PP frame mated with a PPK barrel to conform to regulations set forth by the 1968 Gun Control Act) has been made in the United States under the auspices of various entities. German manufacture was also resumed apace. Other versions, such as the PPK/E constructed by FEG in Hungary and the PPK/L with an alloy frame are also seen. Calibers available include a .22LR with a nine-round magazine capacity, .32 ACP with a seven-round capacity and the .380 ACP with a six-round magazine. The PPK (top) was a spin-off of the PP (below), which was shortened for concealment and ease of carry. The PPK was, and is, one of the finest pocket pistols ever devised. While some early, exotic variants can bring phenomenal prices on the open market, it is still possible to buy good, serviceable, used, post-war guns from various online sources. I have been a fan of the PP and PPK for a number of years and even carried one for personal protection in 7.62mm from time to time. Each one I have tried has been reliable in the extreme and accurate enough to handle the chore for which it was intended. Sure, I'll be the first to admit, there are newer, higher-powered, probably more effective concealed-carry semiautos out there, but for sheer style, the PPK is a tough act to follow.